By Samantha Phillips | January 5, 2019 at 12:01a.m. Minimum wage workers in Ohio are ringing in the new year with a slight increase in their paychecks. The 25-cent pay increase applies to hourly minimum wage workers who work at a company bringing in more than $314,000 a year. The minimum wage, however, is still below what some researchers designate as a livable wage for Mahoning and Trumbull counties. According to data from the Massachusetts Institute of Technology, a single adult would need to make $10.15 an hour, or $21,112 a year, in Mahoning or Trumbull county to pay for bare necessities, assuming the person lives in a studio apartment, has a low-cost food plan and drives a used car or uses cheap public transportation. A family of two adults and two children with one of the parents working would need that person to make $22.57, or $46,945 a year. “Most people agree, and there have been polls done on this. If someone is working full time, they should be able to earn enough to comfortably survive ... without having to deal with problems like homelessness or starvation,” said A.J. Sumell, Youngstown State University Economics professor. Sumell pointed out there is still a difference of about $1.50 an hour between the current minimum wage and what is “livable” according to MIT researchers. The data don’t account for elements such as building a savings or dining out. Sumell said it would be ideal to have a minimum wage above what is needed for just the bare necessities, so people can save money and live more comfortably while having money for some amenities. “Most studies show that incremental increases in minimum wage do not have adverse impacts in terms of unemployment rates and do not cause inflation, which are the biggest concerns associated with increasing minimum wage,” he said. When the minimum wage increases throughout a geographic region rather than one city, it’s less likely to impact local businesses in a negative way, Sumell explained. For example, if only Youngstown increased minimum wage, businesses there might be inclined to move to a neighboring municipality to decrease costs. 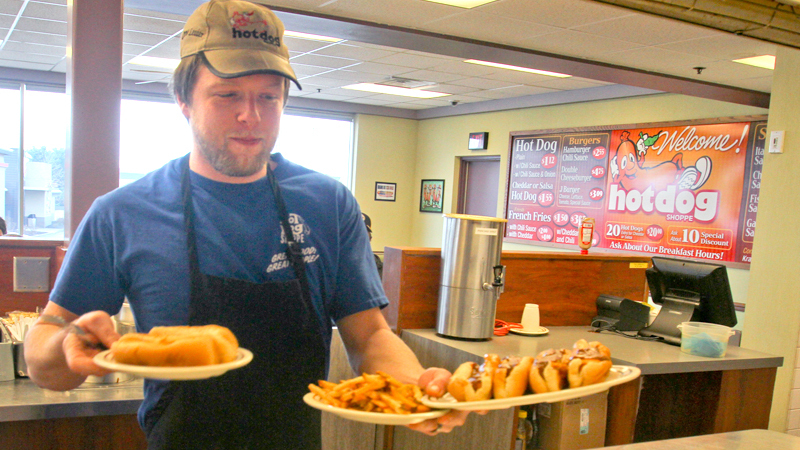 Chip Doverspike, co-owner of Jib Jab Hot Dog Shoppe in Girard, said the increasing minimum wage hasn’t had much of an effect on his business or its prices. “As long as everyone goes up at once, we are fine; it doesn’t really bother us,” he said. Some of the minimum-wage workers at the shop are college students or young parents; others started working there decades ago. Shane Sharlock, 30, of McDonald, a crew leader who has worked for the shop since 2004, said what keeps him there is a combination of the family atmosphere, how the owners treat them and the tips, which are distributed based on performance from a tip jar. minimum wage has been stuck at $7.25 since 2009, Ohio’s minimum wage has been increasing incrementally since it was $5.15 in 2006. In 2018, Democratic lawmakers, including state Sen. Joe Schiavoni of Boardman, D-33rd, introduced a bill to increase Ohio’s minimum wage to $15 by 2025. In this plan, the first raise would be to $12 an hour, and it would increase incrementally yearly. “When you have $12 an hour, you have a workforce that is more motivated,” Schiavoni said. September 28, 2016 5:32 p.m.
October 24, 2015 6:45 p.m.